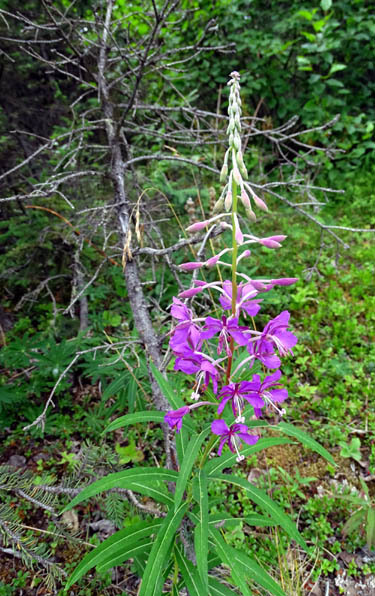 the northern Anchorage area to Palmer." 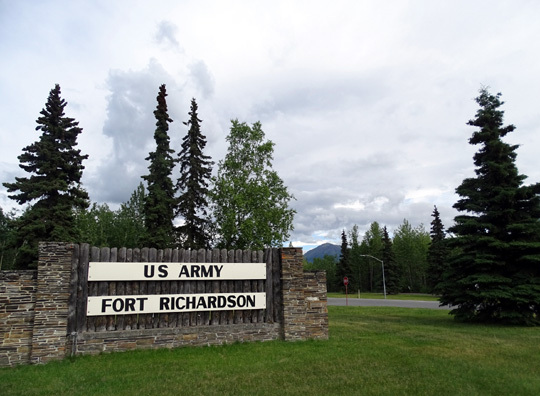 Elmendorf Air Force Base and the the Army's adjacent Fort Richardson were combined in 2010 during the Defense Department's base closure and realignment efforts to increase the country's military efficiency and reduce costs. 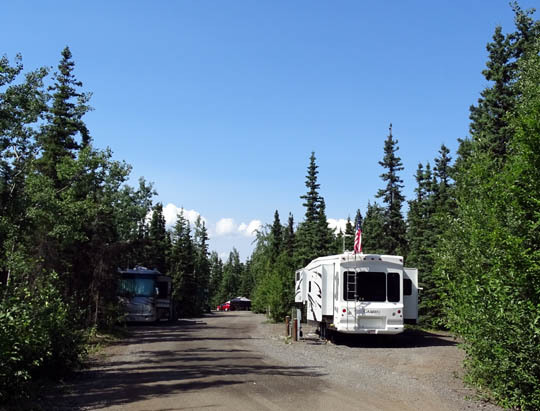 JBER, pronounced JAY-bear, has two large campgrounds, one on the Elmendorf side and one on the Richardson side. 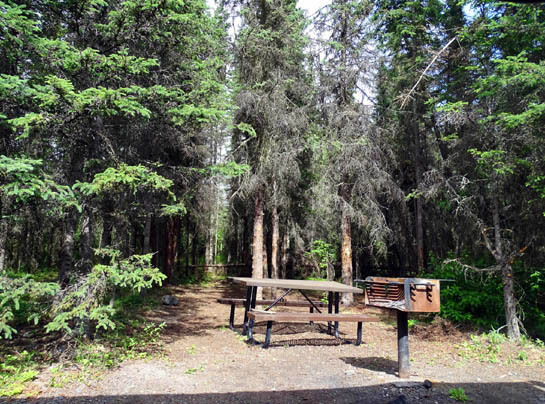 We prefer Black Spruce Campground on the Richardson side because it has full hookups. The other campground, simply called FamCamp, is spacious and attractive but it has just water and electrical hookups. 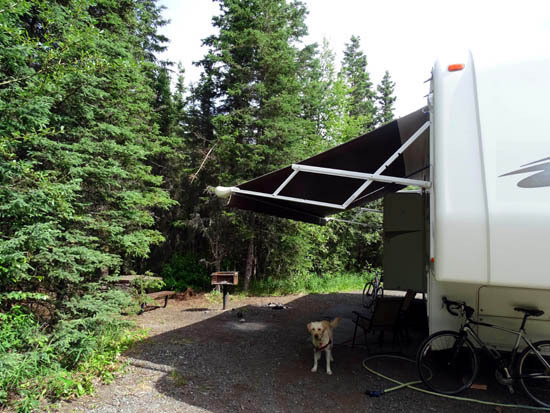 When we were here in 2012 we stayed at Black Spruce three separate times for a total of about six weeks. We loved it. 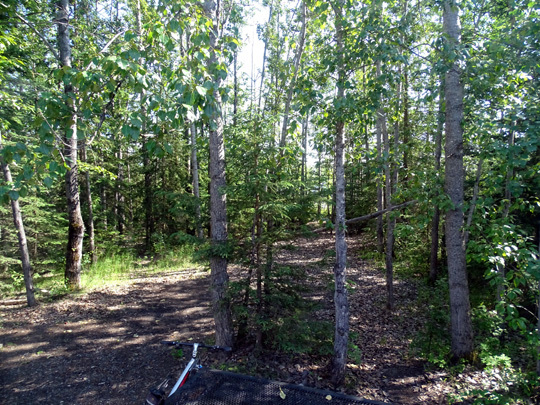 Although each pull-through site sits close to the gravel roadways on the utility side, the door sides all have lots of privacy and space facing the forest. That was great for walking the dogs and watching for visiting moose and bears. We also liked the two host couples, who were retirees. Things are different this year -- not only are half of the electric sites totally non-functional (just water and sewer) because of aging lines, budget restrictions, and someone running over a transformer last year, but half of the remaining sites have very low voltage. Only one-fourth of the sites are fully functional. To make matters worse, prices have also increased significantly and there aren't any retired couples hosting this year. That has changed the ambiance and services provided. 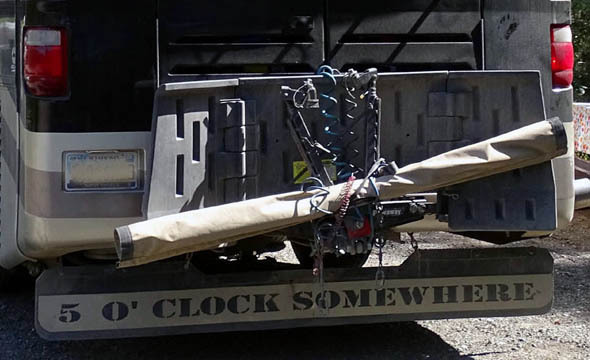 We knew about the problem with the electrical snafu before our arrival from reading the June 14, 2015 campground review by Larry Farquer, the owner of the militarycampgrounds.us website. We really didn't know what to expect when we arrived on June 22 but assumed we'd be in either a site without electricity or an overflow site for at least a few days. 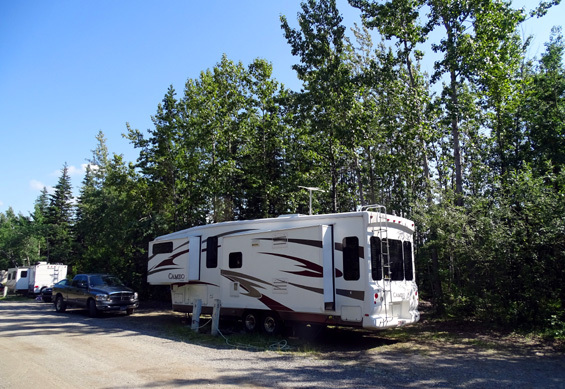 Our first site this summer; all the sites are pull-through with utilities right by the campground roads. 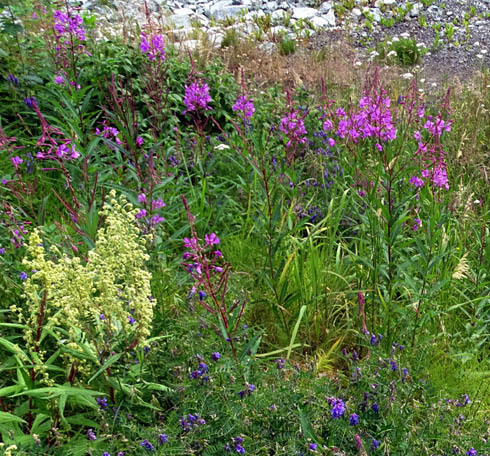 Even though more people are visiting Alaska this year it worked out better than we expected. Other people apparently knew of the problems so the campground has been less full while we've been here. We were initially assigned to a site in the far loop where the voltage was much lower than it should have been. We couldn't run our AC or microwave unless we used the generator but most other uses (coffee pot, computers, TV, lighting, WaterPik, etc.) were OK.
We got on a waiting list for a site with fully functioning electricity and were able to move after a week to the first loop. If we'd gotten on the list sooner, we could have moved sooner. We stayed optimistic for too long that we could manage happily with less-than-optimal voltage. We weren't the only ones requesting an electrical upgrade. The whole time we were in the campground was like a game of musical chairs, with people moving into the twenty or so sites with decent electricity as soon as one became available. Although the site looks similar, our second one had a well-functioning electrical connection. We got every excuse in the book from MWR re: why they couldn't just fix the electrical problems. Although we saw some electrical engineers assessing the situation the power was still out in half the sites when we left July 10 and not working well in half of the remaining sites. The campground would get more revenue if the problem was fixed. Our government at work . . . 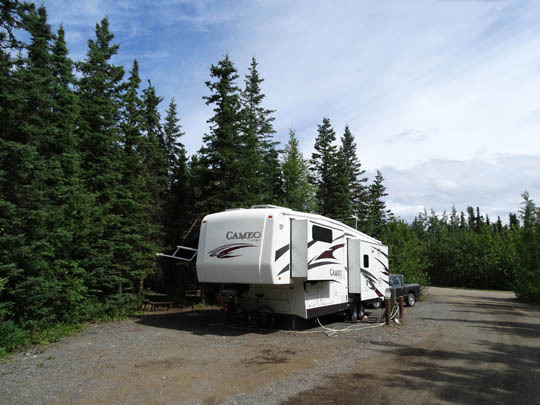 Meanwhile, in the last three years the price for full hookup sites at Black Spruce has increased from $21/night to $33/night and the campground washers and dryers are no longer free. There is no weekly rate. Even though we had only partial electrical service the first several days MWR wouldn't discount our rate. 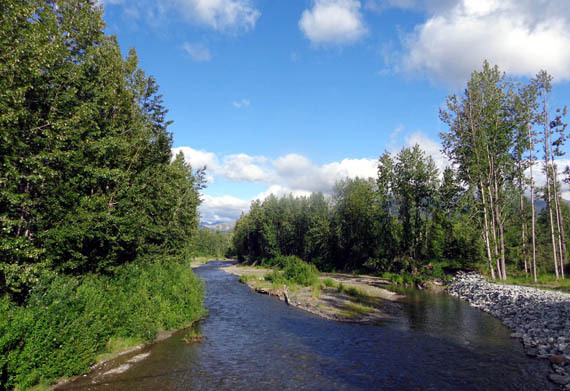 If we hadn't been able to move to a fully functioning site we would have moved to a private campground downtown where we made tentative reservations but the cost would have been about 50% higher. Guess we shouldn't complain, eh? 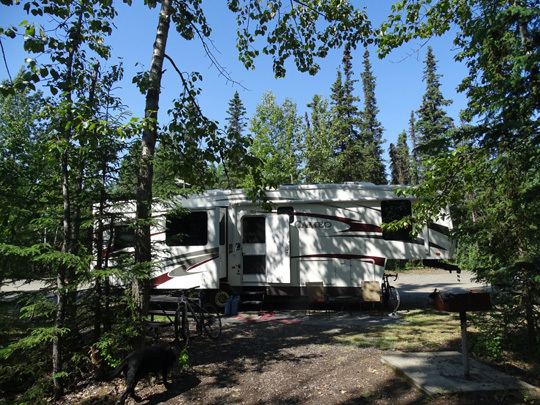 Partial hookups at Black Spruce with just water and sewer have been increased to $25/night. Dry (no hookup) sites are $12. Sites at the FamCamp on the Elmendorf side with electricity and water but no sewers are now $30/night, also a significant increase from three years ago. That's the attitude! This rock guard is on the back of a classy Class A Allegro motorhome. The laundry facilities at Black Spruce were free in 2012 but the washers and dryers didn't always work. Now there are new, more efficient machines. The front-loading washers cost $1.25. Dryers cost $1.25 for 50 minutes. Those prices are in line with other military campgrounds where we've stayed and more convenient/less costly than doing laundry off-base. We have 2-3 Verizon bars on our phones, which is better than we had in a couple of the sites we occupied here in 2012. Our MiFi works fine (no free WiFi here) and we get several TV stations quite clearly with just our camper antenna. 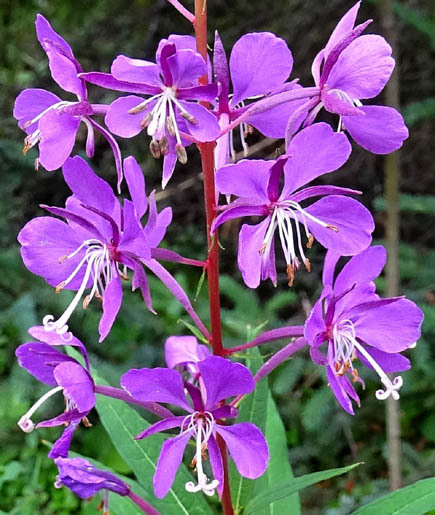 Above and below: partially-opened fireweed blooms in the campground. It's hard for me to articulate the difference in the campground hosts. We miss the amenable retired couples that were here three years ago. This year a 30-ish couple with several young kids is using the cabin at the campground entrance for an office and living behind it in a small trailer. They don't seem to have any meaningful assistance for whatever it is they are supposed to do beyond assigning incoming guests to a site and trying to answer questions. They don't have the knowledge or gracious communication skills most retired hosts display at military campgrounds. Perhaps they'll be more experienced and comfortable with retirees by the end of summer? 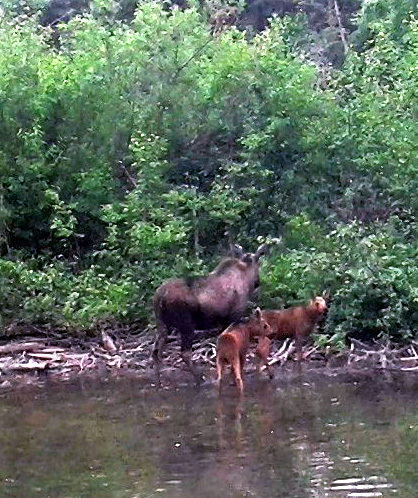 In 2012 we had numerous moose and several bear sightings in the campground. That was one of our fondest memories of our first Alaska trip. We hoped to replicate that experience at Black Spruce again this year. 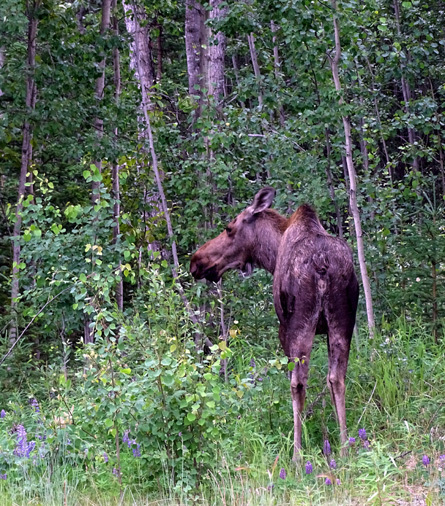 Since he arrived this spring Dan, the young campground host, has seen a large male moose and seven black bears, including a mom with three cubs. 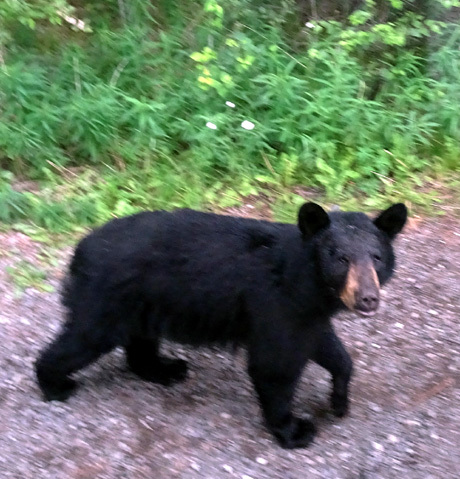 We were disappointed to see no moose in the campground this time, but we did have several bear sightings. 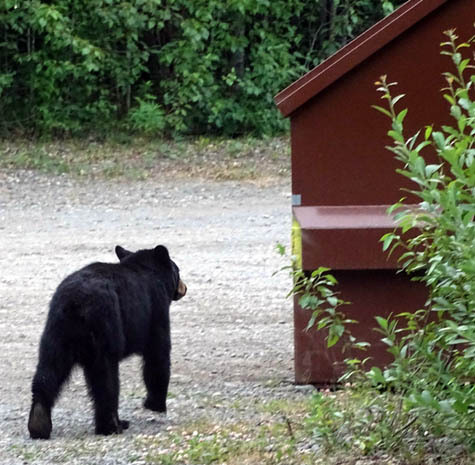 The day we moved to our new site we saw either two different yearlings or the same small bear twice and Jim happily remarked, "This is the Alaska I remember!" 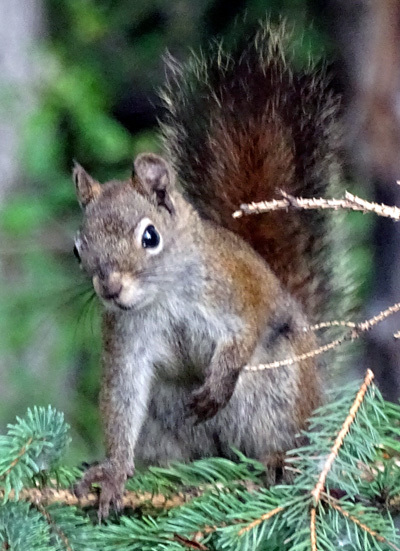 I didn't have a camera with me when I had the first sighting while walking Cody near our site. The dogs were going nuts, of course. 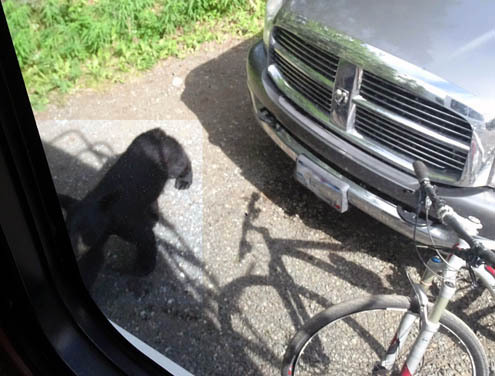 They can always smell a bear, even from inside the camper. 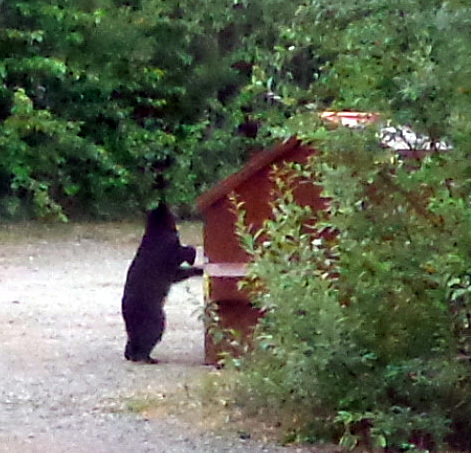 We do not leave them outside unattended in bear country. 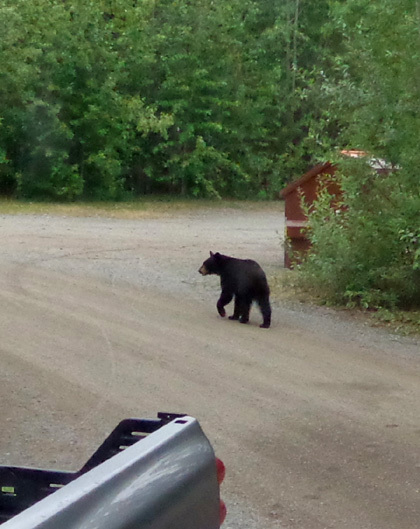 When we were here in 2012 the bears seemed to have free reign in the campground. This summer Dan summons a game warden every time someone tells him they see a bear. I don't know if they are tranquilized and relocated or just frightened away with gunshots. We have mixed feelings about it so we haven't reported all of our sightings. We have warned other RVers, though. Hmmm . . . something smells good up there. I think I'll just climb in here for a closer look . . .
though, in case they leave some real food out here by mistake some day. 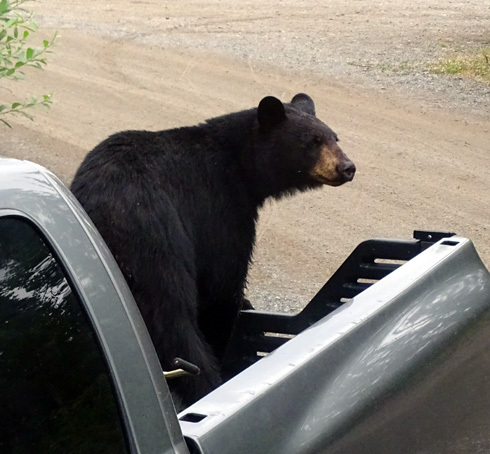 Granted, we shouldn't have left the empty cans in the bed of the truck; we just didn't think about the odor attracting a bear. Our bad. 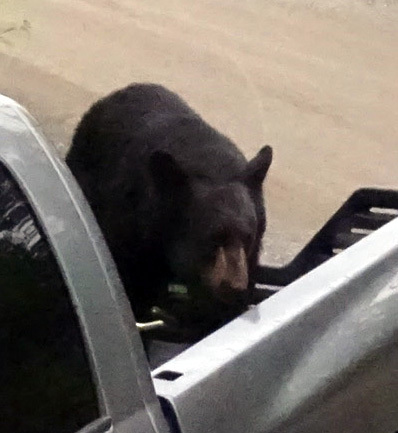 On the other hand, no one got hurt, the bear meandered off to inspect the nearby dumpster when it realized there wasn't anything to eat in the back of our truck, and we got some great pictures. 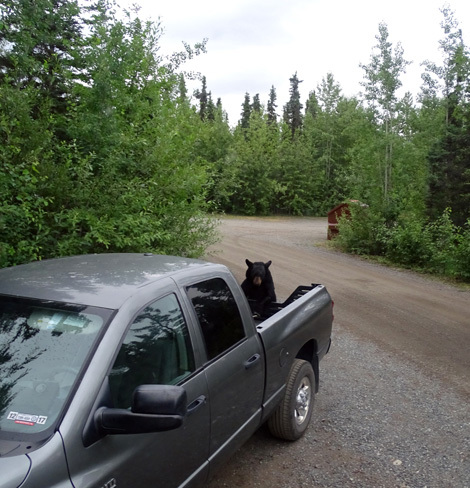 Cody noted later that the bear peed behind the truck, apparently marking his territory like a male dog. two-legged creatures don't latch the lids like they're supposed to . . . Better look around to see if the game warden is anywhere near! Another day I was walking Cody on the far side of the campground when he caught the scent of a bear (the same one, perhaps?) that a game warden had been chasing. The warden was just getting back into his truck when I walked by his truck. A woman in one of the campers came out to warn me that a bear had recently run through the area. I went the other way (I thought) and Cody suddenly stopped to smell the ground and sniff the air toward the woods. His hair bristled up. As the game warned pulled his truck toward me I pointed at Cody's body language. The warden rolled down his window and told me that's where the bear reportedly went into the woods. I said I know, Cody has done that before when a bear is nearby. I joked that he could borrow Cody to help find the bear, if he wanted. He grinned and declined. I said, "Seriously. You need a Labrador retriever on your team." Our keen-scented Labs both sure know when a bear is close. 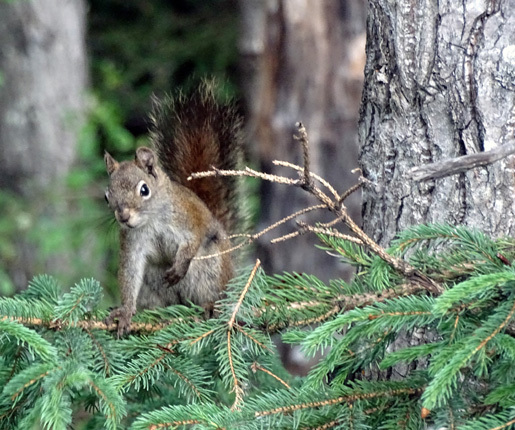 Above and below: Busy little squirrels amuse us at our campsite, too. 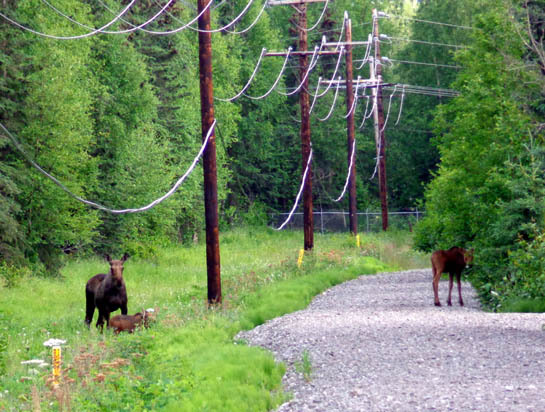 We did much better with bear and moose sightings on our bike rides and hikes on base, especially near Ship Creek and the fish hatchery. I included some photos of them in the next section below. 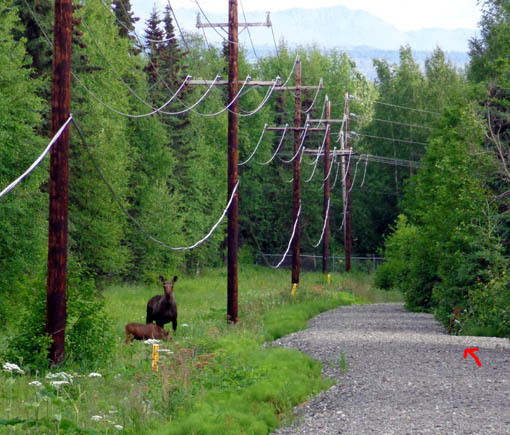 In 2012 we also had several close encounters with bears and moose along the Coastal Trail in Anchorage. We didn't ride there as often during this visit and didn't see nearly as many large critters. They are probably still there; we just weren't at the right place at the right time. 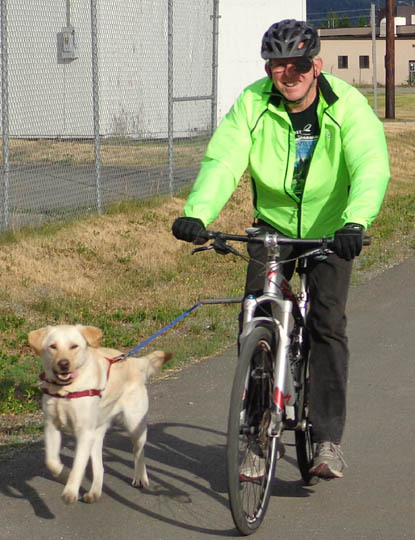 Every day at JBER we've gotten outside to ride our bikes (Jim, mostly) and walk (Sue, mostly). We have lots of places to do both on this large base. Oddly, the weather is often nicer late in the afternoon and evening than in the morning or early afternoon. Some days have been overcast and/or windy earlier in the day, then absolutely gorgeous in the evening hours after we've already done our rides or hikes. A few times we waited until after supper to go out since it's sunny till almost midnight. 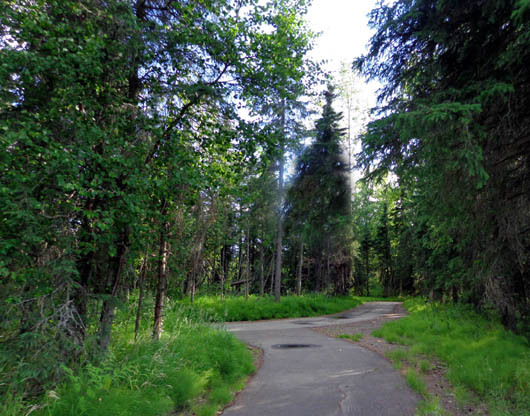 Above and below: Two different bike trails on base; the roads are perfect to ride, too. I can't believe I'm saying this after the cool, wet summer we had up here in 2012 but the area really needs more rain this summer. 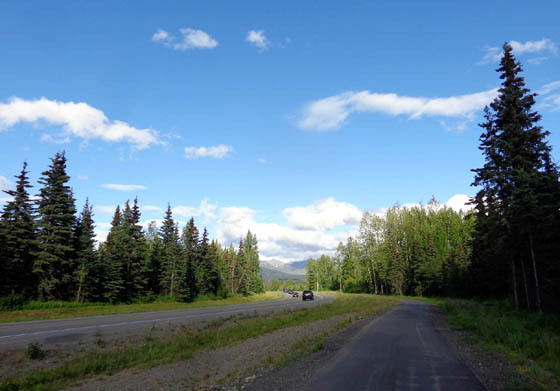 Southcentral Alaska had a low snowfall this past winter season and less rain in the spring than usual. Wildfires and dust are a problem and plants need more water. Jim and Casey head out for a ride/run. Since he's training for a 100-mile bike ride in July, Jim also got in some long solo rides of up to 50+ miles. 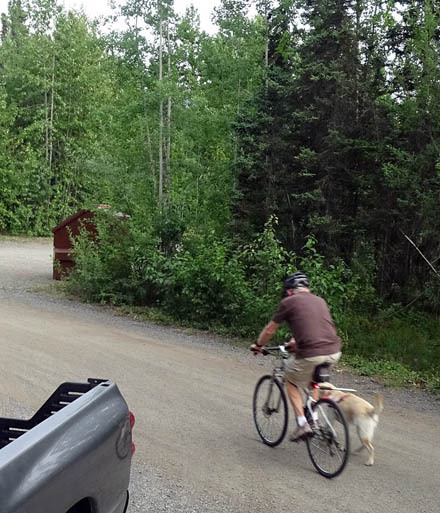 He did most of his mileage on base, with some additional rides north to Chugiak or south in Anchorage (more about our rides on city bike paths in the next entry). 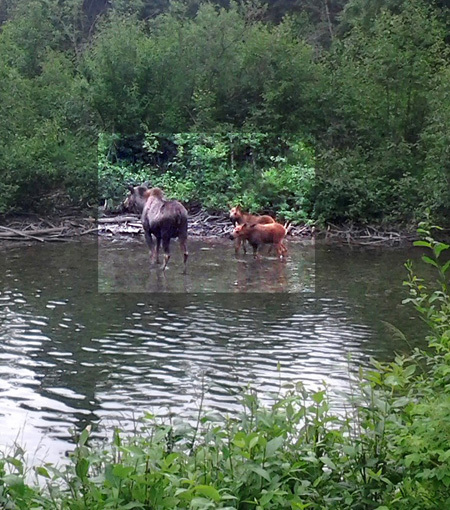 Above and below: Jim took these shots of the moose trio with his cell phone. Above and below: Another day I spotted Mom and her twins farther back the trail. Any time we stay at an Air Force base or Army/Navy base with aircraft we can expect some noise overhead. JBER is no exception. It was fun in 2012 to watch the F-22s and cargo planes come and go on a daily basis, and we even lucked out with out timing-wise when an air show was scheduled during one of our visits. The sparse expanses above Alaska are a little more crowded this month as nearly 200 military aircraft are taking part in an annual training exercise. Nearly 6,000 military members from all four branches are taking part in Northern Edge 2015, which includes naval exercises in the Gulf of Alaska and some operations involving ground troops. The U.S. Pacific Command exercise, coordinated by command leaders in Alaska, tests the readiness of the nation's troops and isn't in response to any increased tensions with any other nation, said Lt. Col. Tim Bobinsky, who is helping lead the exercise. Northern Edge is normally held every two years, but this is the first exercise since 2011. The government shutdown, or sequestration, forced the cancellation of exercises in 2013. 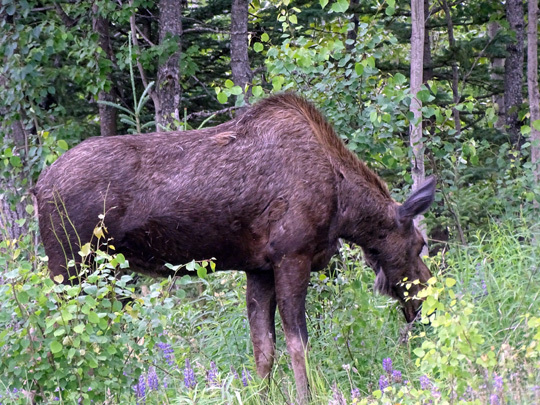 Above and below: Moose feeding by one of the main roads at JBER; note the pretty blue lupines. Bobinsky said Alaska offers the military a unique training opportunity, including 65,000 square miles of air space. 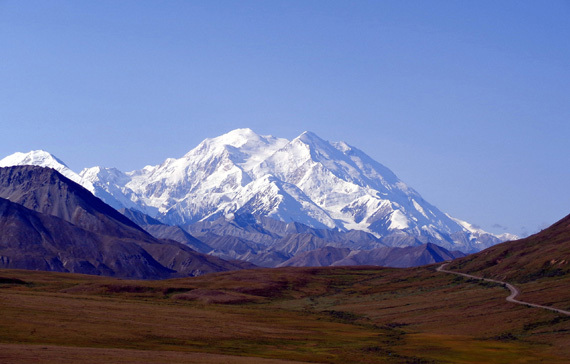 "As everyone knows, Alaska is very large," he said Tuesday. "And because of that we have some great opportunities to have some large training air spaces that give us awesome opportunities to conduct things that we can't do in very many other places, not just in the United States but around the world." Alaska also offers land and sea to accommodate maritime and ground forces exercises. Three U.S. Navy destroyers and a submarine are taking part in simultaneous exercises in the Gulf of Alaska, but not without controversy. Some people in gulf towns such as Cordova and Kodiak have protested the exercises, worried about what the Navy's presence might do to salmon and other marine life. One of those ships, the guided-missile destroyer USS Shoup, is expected to sail up Cook Inlet and dock at the Port of Anchorage on Wednesday. Although we ran errands all over town that day we forgot to drive close enough to the port to see the destroyer. Since we were here in 2012 a new super WalMart and Sam's Club have been built closer to JBER than the other WM and SC stores already in the city. The Sam's Club is right outside the Muldoon Gate, near Target, Lowe's, and PetsMart. Unlike the other WalMarts and Sam's Clubs in the area, this one has a fuel station with both diesel and gasoline. The new WalMart is at the intersection of DeBarr and Muldoon. One day we were over at the Outdoor Recreation building on the Elmendorf side of the base when we literally felt the earth move -- a 5.8-magnitude earthquake hit about 80 miles northwest of our location. That's the first time I've felt an earthquake that strong. We were at a tall counter when it rocked back and forth as if it was on wheels. Everyone did a double-take, then someone said in a blas� manner, "Oh, that's just another earthquake." Just another earthquake . . . Alaska does get more of those than most places.